The Boy and I joined a book club a few months ago – I’ve aways been a reader, but this encourages me to read things outside of my normal comfort zone since other people are usually the ones picking the book. 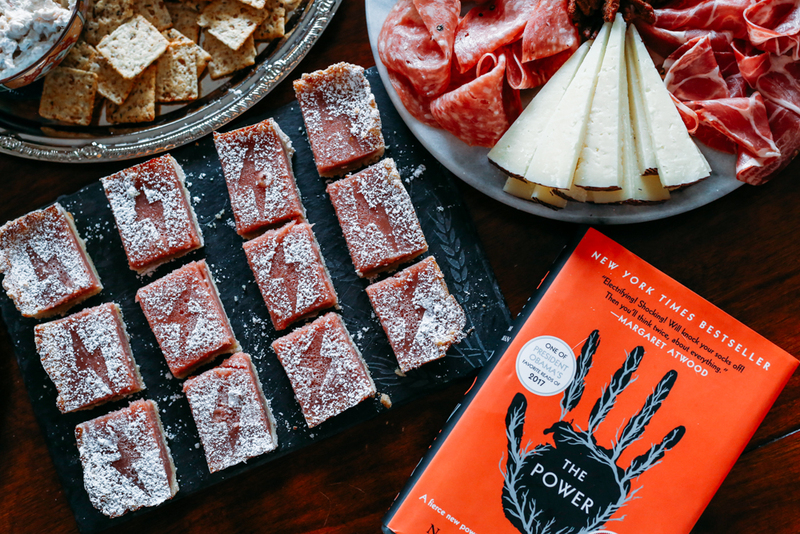 The way it works is if you choose the book, you host the monthly meeting, which is how the Boy and I ended up hosting the meet-up for his pick, Naomi Alderman’s The Power. The Power is, in extremely short summary, a speculative novel about what would happen if women had more power than men – in this case, specifically the power to produce a deadly electrical charge at will. It’s very interesting and very good, both as a gripping story and as a piece of fiction that makes you think about the world (so all in all, good for book clubs). 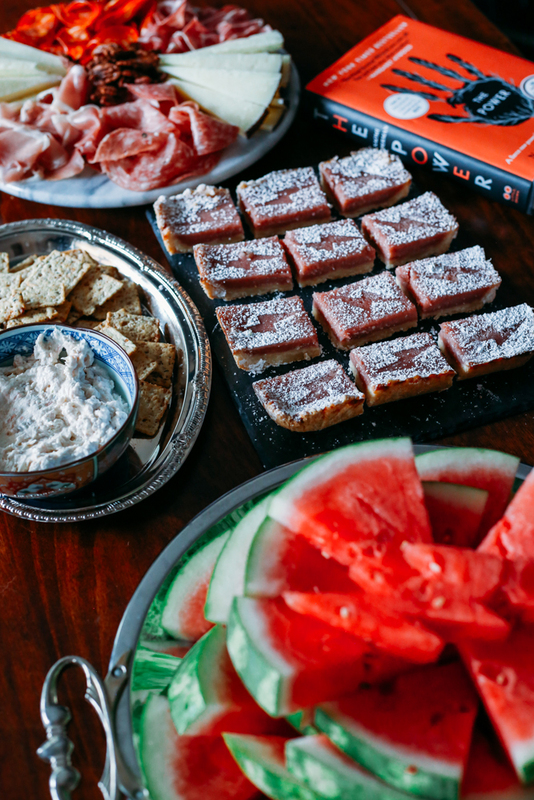 The spread included a charcuterie plate, smokes salmon dip with everything-bagel-spiced crackers (thanks Trader Joe’s), a big plate of watermelon with the top piece carved into a lightning bolt, and Smitten Kitchen’s Pink Lemonade Bars, my homemade contribution to the smorgasbord (I’ve finally learned that the trick to successful entertaining is to mix one or two homemade things with a bunch of prepared things and save yourself the stress). They were pretty AND they were yummy! 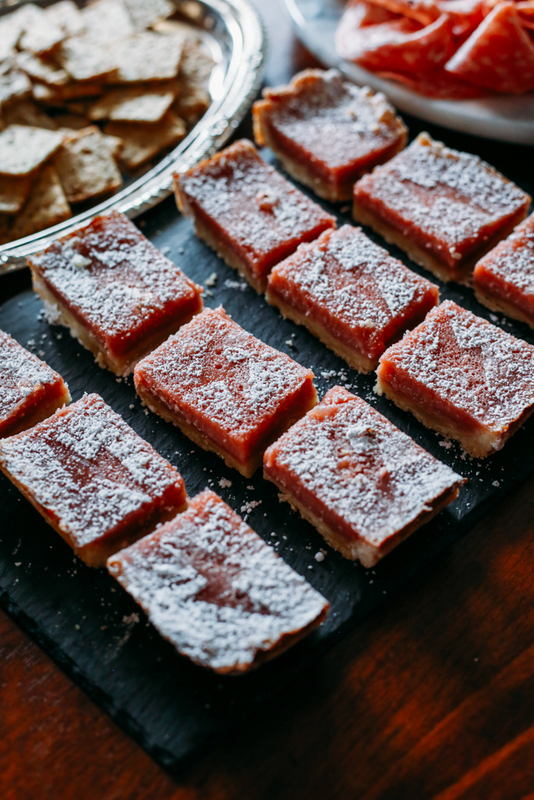 The “pink” in the pink lemonade was created with fresh raspberry puree, but otherwise these are just a dynamite lemon bar recipe. It went something like this: Make the crust (a simple press-in variety), make the filling, pour in, and bake! I cut a special little lightning bolt stencil out of paper to add some extra “The Power” flair to the powdered sugar decor (you do have to do that right before, as the bars will absorb the sugar as they sit), but that really was the most finicky part of the whole thing. 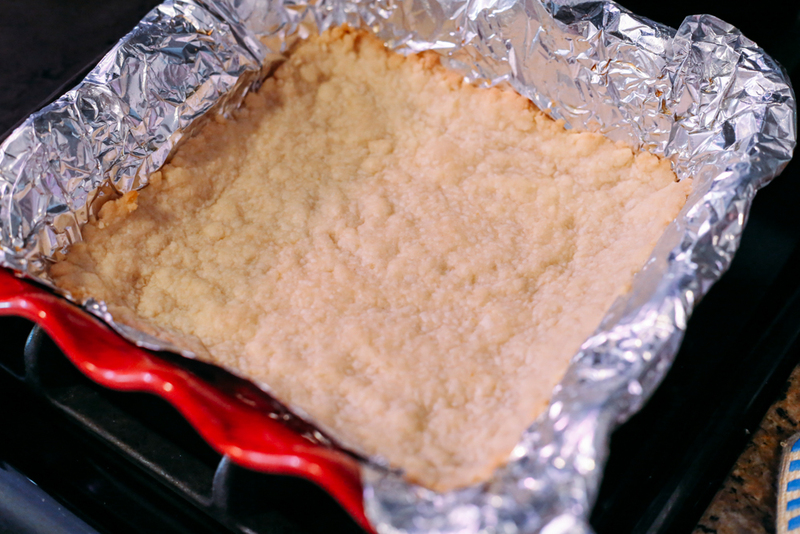 Preheat your oven to 350°F (180°C) and line an 8x8x2-inch baking pan with parchment, letting it extend up two sides. 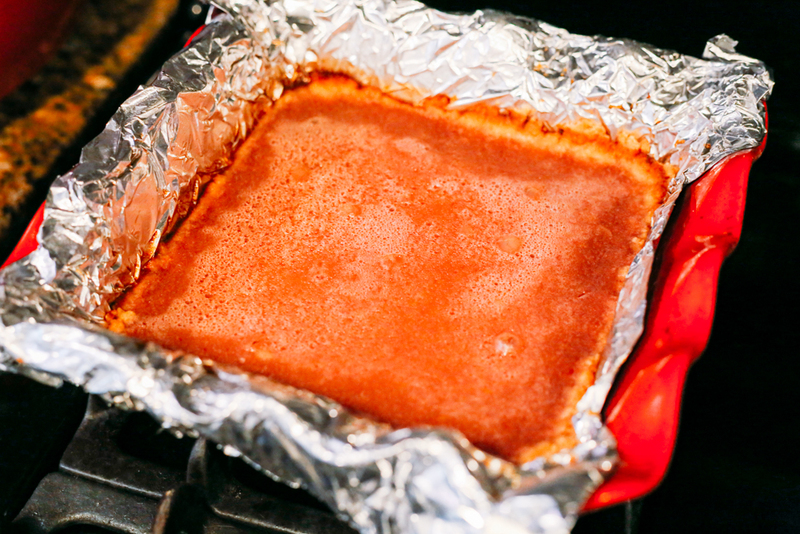 Butter or coat the bottom and sides with a nonstick spray and set the pan aside. Make the Base: In a food processor, pulse together the sugar, zest and salt until combined. Add the butter and pulse until it is evenly dispersed in the dough. Add the flour and pulse the machine until it’s just combined and the mixture is crumbly. Press the dough into the prepared pan and about 1/2-inch up the sides. Bake for 15 minutes, until lightly browned at edges. Let cool on a rack while you prepare the filling (though no need for it to be completely cool when you fill it). Leave oven on. 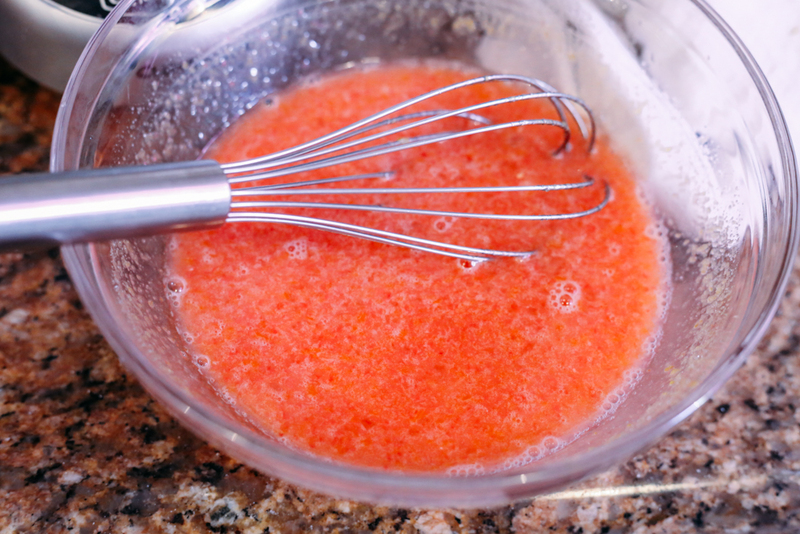 Make the Pink Lemonade Layer: Puree the raspberries in your food processor until they’re as liquefied as they’ll get. 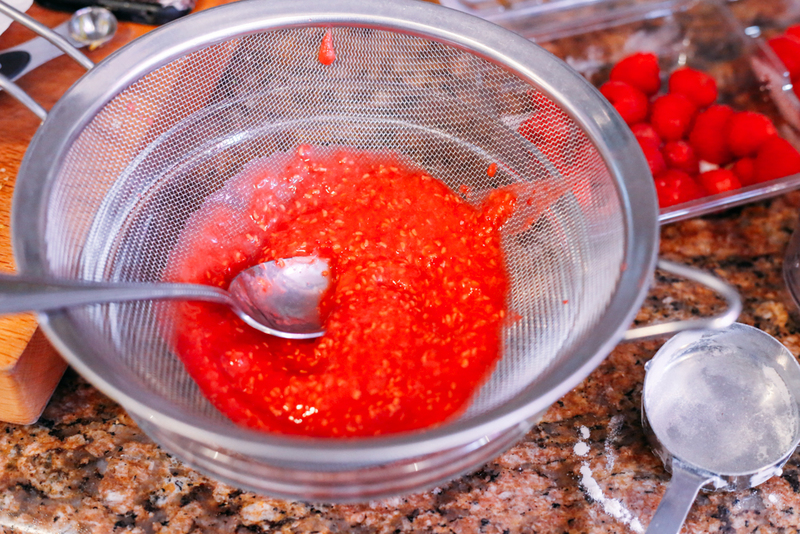 Run the puree through a fine-mesh sieve, trying to press out all the raspberry puree that you can, leaving the seeds behind. Deb cut hers into 28 2×1-ish rectangles. 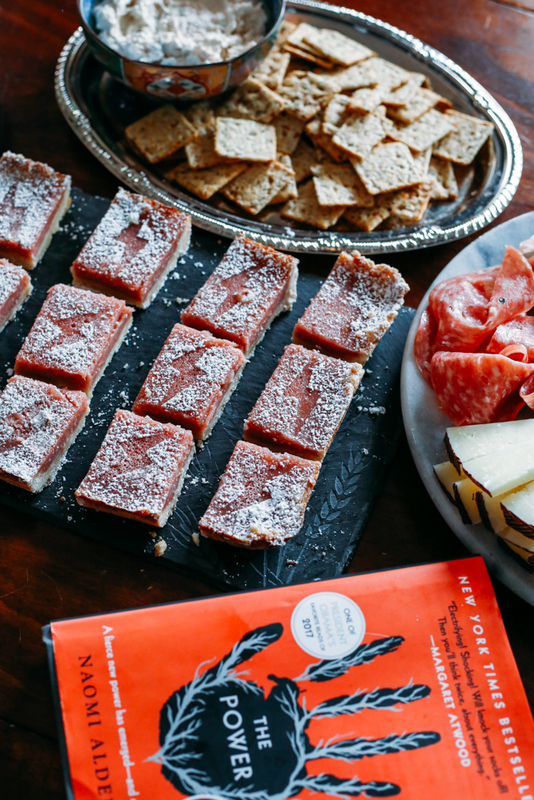 Mine ended up as 12 larger rectangles for ease of slicing…so trust your instincts? Dust with powdered sugar before serving. Store in fridge for up to a week.